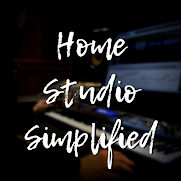 Home Studio Simplified: Mixing with Headphones!?! There are so many "rules" to mixing that I break nearly everyday, and despite what popular opinion states, my mixes don't seem any less desirable when mixed on headphones. Much like anything else, I always check them by the "rules". (On my reference monitors) But, I don't have to adjust much usually, and sometimes not at all! Anytime you buy new monitors you have to get used to them, if you switch studios or move to a different room to record, you have to adjust to that as well. The same goes with mixing on headphones. Once you get used to them, learn their strengths and weaknesses, you can churn out some great mixes on them! Here are some tips to mixing on headphones that have got me great results. 1) If you are using closed back headphones make sure to expect more bass on the mix. Open backed headphones are more accurate to represent bass levels. 2) Mix it just like you want to hear it, then reference on other sources to pick up on the discrepancies. However, don't expect bad speakers to make a good mix sound great. 3) Keep a copy of music you love with you, music that has been professionally mixed and mastered. These songs will help you know what your mix should strive to be on the different sources you are referencing on. 4) Don't turn up that volume just because your neighbors can't hear it now. Listen at a level that won't tire your ears to quick. 5) Make sure that you invest in a set of comfortable headphones. I use the Audio Technica ATH a700's. Their re-design of the headrest, that they call wings, set so comfortably on my head that they aren't even noticeable.